Very helpful book for AP Chemistry. If you're used to Barron's, the Princeton Review book series is fairly similar in format. Overall an excellent resource for the AP Chemistry test. The book gives concise and useful information of what to know for the test, and just reading the well-written sections helps immensely. The multiple choice reviews also encapsulate the Big Ideas well. The difficulty is very similar to that of the AP test. The open-ended portions tend to be varying levels of difficultly, and are honestly organized poorly. Some chapters have 5 super easy problems, others have huge, time intensive and unrealistic problems. This AP Chemistry Review book is a much better one. 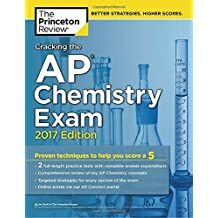 Compare to the AP Physics 1 and AP Physics 2 books from Princeton Review, this AP Chemistry Review book is a much better one. It covers all the materials needed on the actual exam and no more. 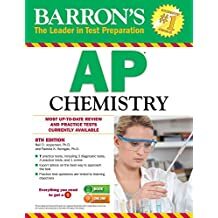 It deleted some stuffs no longer on the exam (organic chemistry) compare to other review books such as Barron, saving you a great deal of time and making your studying process much more efficient. There are plenty of practice questions after each chapter with through explanations which really strengthen my knowledge that I missed in class or already forgot. Some errors do exist but overall it does a pretty good job summarizing the revewing stuffs needed for the exam. Most of the questions are fine; some do not have the standard challenges of the new AP Chem exam questions. The Practice Test, however, is still a very good resource for my students. Big book but light in weight, but the paper seems to be off-white. Recommended by my son's College Prep High School to study for his AP Chemistry exam. My son found the book to be an excellent source to use to study for the exam. Needless to say, the 2016 exam was really hard! 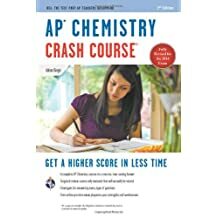 I bought this book as an extremely nervous and hectic junior who was scared for his own life coming into the AP chemistry exam. Now, after the fact (and having scored a 5), I would have to say this book is definitely overkill. Does it help you study and prepare thoroughly? Yes, but I think it goes into unnecessary depth, and some subjects that were covered by the book weren't even on the exam! But honestly, it's always better to go in over-prepared, just in case the test makers decide to trip you up with an obscure topic. Overall, it's an okay book and worth a quick read-through, but I wouldn't spend too much time with it. 4/5 stars because it wasn't as effective and helpful as it could've been. I wouldn't skip over it completely either, because it definitely hits some key points that helps you immensely during the test. For a gauge of how difficult the actual AP exam was, imagine somewhere between the difficulty of the example tests on collegeboard (easy) and the practice tests on this (very hard). But the actual test is definitely NOT as hard as the practice tests in this book, and there's no use to worry needlessly if you can't answer some (or quite a few) ridiculously hard questions and freak out about not being prepared (which is what I did). So far, so good! It's the only book I've reviewed for my students that actually aligns with the new curriculum, labs included. So many mainstream books advertised that they were updated for the new curriculum, yet included the old list of labs and reduced practice multiple choice to four answers. Not much of an update if you ask me! This book is legit. Bare bones review of the essentials. If you focus on what Adrian has presented here, you should be in great shape! Helped me as a teacher to sift through the new curriculum as well! This book is fantastic in preparing you for the exam, or for tests in an AP chemistry class. I used it for both, and it did it's job well for both. I will update with my AP score (I am more than confident that I earned a 5) later.This book is to the point on all topics. It tells you exactly what you need to know to solve the problems and explain the concepts (the topic and test aren't all math-based, after all) on both the MC and FRQ sections of the test, and IT MAKES SENSE. Great study book it helped so much in studying for the AP chem exam! I find the amount of information to be less overwhelming than some other study books I've used for other subjects. The chapters are short, but have just about everything you need to know with a few practice questions at the end of each chapter with explanations. I did find it a little strange that there was not a section about electrochem, but there was only one question on that topic on the AP exam this year that I can remember. I would definitely reccomend this book to anyone and I will be purchasing books of this brand for other subject from here on out.